Stargazers looking to the sky in August will have a planetary smorgasbord at their disposal. Mars, Jupiter, Saturn and Venus all get their time to shine this month. In fact, the only bright planet not available for viewing sometime during August is Mercury. The closest planet to the sun will be too near to the star to be seen from Earth. 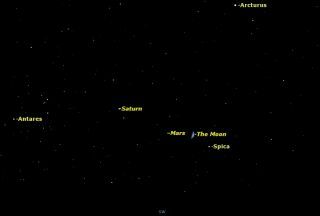 On Aug. 2, take note of Mars sitting about 6 degrees to the moon's left. Your clenched fist held at arm's length measures about 10 degrees, so that evening the moon and Mars will be separated by just a bit more than "half a fist" in distance. For the first time this year, Mars will set before midnight as the planet's viewing season continues to wind down. At magnitude 0.4, it still ranks among the brightest objects in the evening sky as it cruises across the constellation Libra and on toward Saturn and the head of Scorpius toward the end of the month. Saturn is in the southwest at dusk on Aug. 3, a yellowish point situated 12 degrees to the left of Mars, whose yellow-orange light provides good color contrast. Saturn's rings have begun to ever-so-slowly "open up" again: the north face of the planet's signature ring plane is now tilted 21.1 degrees toward Earth. To see the rings, you'll need a telescope that magnifies at least 30-power. Venus and Jupiter will rise shortly after the first light of dawn above the east-northeast horizon in mid-August. The two planets, which have been nearing each other throughout the month, will engage in the closest planet conjunction of 2014 on Aug. 18. The gradual buildup to this cosmic rendezvous actually began in July as Jupiter, emerging from out of the bright morning twilight, slowly began to close in on Venus from the lower left as viewed each morning before sunrise. Venus is by far the brighter of the two, outshining Jupiter by seven times. On Aug. 18, viewers with clear weather on the East Coast will see the pair separated by just 15 arc minutes, or about one-half the apparent diameter of the full moon. Three hours later, when it will be the West Coast's turn to see them rise, the gap between them will have widened to 20 arc minutes. For the rest of the month, Jupiter steadily climbs to Venus' upper right. The three brightest objects in the night sky — the moon, Venus and Jupiter — will form a large triangle low in the east-northeast sky an hour before sunrise on Aug. 23. The Jupiter-Venus/Jupiter-moon sides of the triangle should measure about 5 degrees long, while the base of the triangle — the Venus-moon side — measures about 9 degrees. The moon will appear as a razor-thin sliver illuminated only 4 percent by the sun. Mars will also pass 3.4 degrees below and to the left of Saturn on the evening of Aug. 23. Both planets shine at magnitude 0.6 and make for an eye-catching color contrast. Mars appears distinctly orange-yellow while Saturn glows yellowish-white. As darkness falls on this last night of August, look toward the southwest sky to see another triangle, one formed from a fat crescent moon, Mars and Saturn. Editor's Note:If you have an amazing skywatching photo you'd like to share for a possible story or image gallery, please contact managing editor Tariq Malik at spacephotos@space.com.